VATICAN CITY (CNS) — Pope Francis asked people to generously serve those most in need and to never waste food. “Never throw away leftovers,” he said July 29 before reciting the Angelus prayer with people gathered in St. Peter’s Square. Leftovers should be eaten later or given to someone in need who will eat them, he said, advising people to talk to their relatives who lived through the aftermath of the Second World War and ask what they did with any uneaten food. The pope made his comments during his reflection on the day’s Gospel reading about the multiplication of the loaves. He praised how the young boy in the account came forward with the little he had — five loaves and two fish. “Young people are like this, they are courageous. We have to help them continue” being brave, he said. Humanity is hungry for “bread, freedom, justice, peace and, above all, divine grace,” the pope said. And God’s love can satisfy them all through his disciples and through those, like the young boy, are moved by compassion and contribute what little they have. Proclaiming Christ demands a generous commitment of solidarity toward the poor, the weak, the least and the defenseless, he said. He also encouraged global policies that encourage development, nutrition and solidarity, and not hatred, weapons and war. 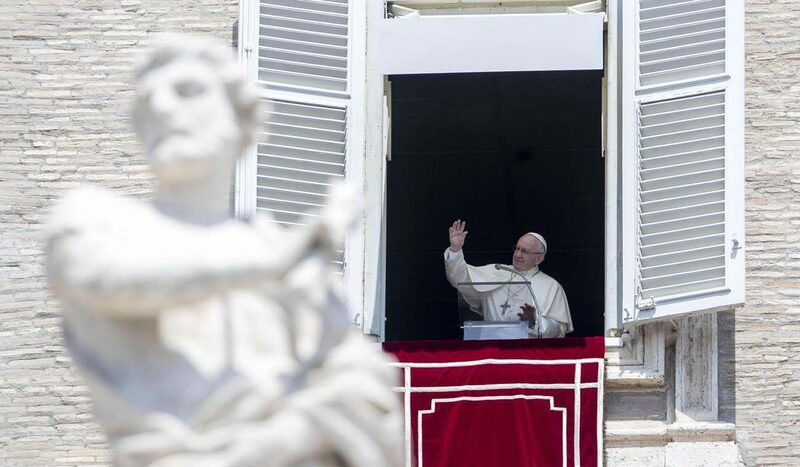 After praying the Angelus, the pope reminded people that it was everyone’s duty to denounce and oppose the “shameful crime” of human trafficking. World Day against Trafficking in Persons, celebrated July 30, seeks to raise awareness about “this scourge,” which “reduces many men, women and children to slavery,” he said. “It is the responsibility of everyone to denounce injustices and firmly oppose this shameful crime,” he said. Meanwhile, the pope sent a message the World Christian Life Community, which was holding its world assembly in Buenos Aires July 22-31, and was marking its 50th anniversary. The association, which is inspired by Ignatian spirituality and integrates contemplation and action, works in solidarity with the poor and marginalized. “To be guided by a Christian way of life, with a strong spiritual life and working for the kingdom, means letting oneself be shaped by the love of Jesus, having his same sentiments, asking oneself continuously: What have I done for Christ? What am I doing for Christ? What ought I to do for Christ?” he said.